Livin' Life With Style : Giveaway! Giveway! Win 4 tickets to Treehouse Big Day Out 2! Back by popular demand, Treehouse Big Day Out is returning to the Molson Canadian Amphitheatre in Toronto on September 12 and 13, 2015. They will offer two separate ticketed events each day- a morning event starting from 9:00am to 1:00pm with stage shows from 10am to 12pm and an afternoon event from 2:30pm to 6:30pm with stage shows from 3:30pm to 5:30pm. They special event will also be televised on Treehouse this Fall. 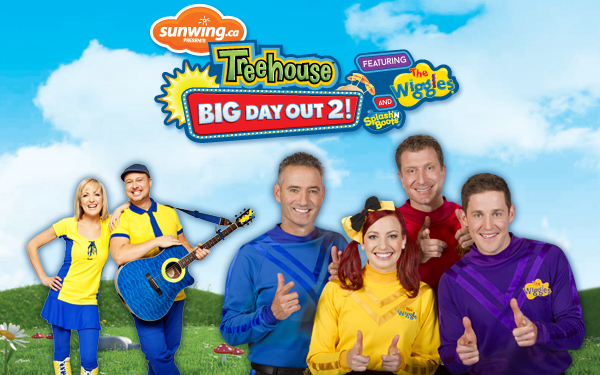 The 2 day live event will feature exciting activities for kids of all age, and special performances by The Wiggles, Splash 'N Boots and Treehouse's own children's music duo. Just some of the activities include meet and greet photo opportunities with fan-favourites Treehouse characters, and a Nelvana digital play station featuring free WiFi to download the new TreehouseGo app, and much more. Also, all attending kids get to take home a festival program full of activities and colouring pages. The Wiggle's will also sing songs from their brand new CD and DVD "Rock & Roll Preschool" that will also air on their new season of their TV series on Treehouse. Tickets for Treehouse Big Day Out may be purchased at Ticketmaster beginning on Friday, June 12. Click HERE for more details. Now who would like to win 4 tickets to the show?! Enter the Rafflecopter App below for a chance to win a pack of 4 tickets. This contest starts Saturday, August 29, 2015 and ends Friday, September 4, 2015. Open to Canadian residents only. Good Luck!